Everyone has a point in their pre-teen years where they discover the road the self-instruction. It’s a point where you finally recognize the path to learning, or to learn about learning. We’re born with ability, we just won’t see it right away. No faith in modern ways tend to cloud knowledge of it. Right from the start we have teachers, systems, or caregivers. As we grow up we’re immersed in an always connected world. Some where in between those two ages the opaque doors that shield discovery are broken through. I recall learning to play chess with my recently retired neighbor. As a fifteen year old it was about finding ways to get better. Find books on chess in the library (didn’t have the web at home in 1993). Get a chess program to play with on the XT. Improve the skill level bit by bit. I sure didn’t exercise these habits when school subjects were in the picture. When on the path, our proverbial student acknowledges his ability to define and take on new challenges. While on the path he learns to tip life out of balance and take on a mindset that’s conducive to change. He’s caught up in a fever and can ignore everything else. Challenges to him could mean both things – those he likes and those he doesn’t. Every day, he ratchets up his skill and challenge level together. 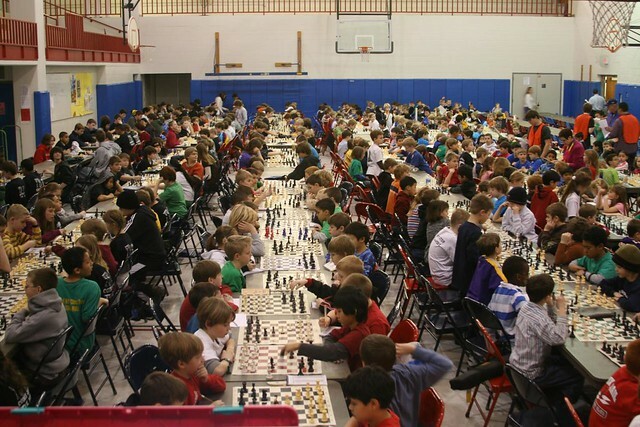 A Chess Tournament, by ninahale on flickr.com. Some rights reserved. Click through for details. It isn’t always a continuous or successful process. Naturally, obstacles that aren’t necessarily in line with cognitive abilities appear – outside his practice, as well as inside it. It’s at this point that we learn what constraints mean. We learn that the path isn’t about pure intellectual or internal achievement. The student works so that learning be life long. It can’t pay off if you’re always in comfortable positions. It certainly won’t pay off if you’re only rigid, or only flexible. It definitely will pay off if you think of failure and success as something we do. Not as destinations. I promise I won’t downplay failure, I know its hard. Both are great teachers that we all need to meet. Meet them early, meet them daily. What the student does right after that meeting is important. At times, he attempts to hide his ability from potential social embarrassment, or perhaps attempts to nurture it protectively; In a way that won’t acknowledge reality. In other words those same constraints that the path starts out from in the first place. The good news – the best classroom where this is happening is the one you’re in right now. Look around. There are others with you too. Dedicated to the inspiring IS318 Chess team.